Use bat mask wall decals to transform your little boys room into a superhero den. Apply as a uniform pattern or randomly on your wall. Available in 22 colours, easy to install, just peel & stick! If you are aiming to create a superhero theme in your boys room, then bat mask wall decals are ideal to have as part of your wall decor. You are not just limited to Batman though, these superhero mask decals come in 22 colours so you can make Superman, Robin or anyone! Bat mask wall decals can be applied to cover an entire wall or just in clusters. 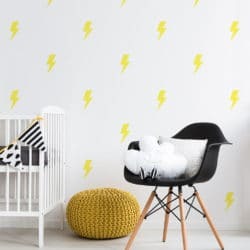 You can also mix and match colours and combine with other decal designs such as the lightning bolt decal’s to expand your decor. Choose a colour that matches or complements your decor, we have smaller pack qualities so you can mix and match colours as you like. Alternatively we have the superhero wall decal pack which includes other designs and offers better value. You will be impressed with the quality of our bat mask decals, we use high quality materials for the Australian market. The matt finish vinyl that we use is specially designed for home decor use on internal walls. Bat mask wall decals will stick to almost any smooth surface such as painted walls, furniture and glass. At the same time, the adhesive is gentle enough to not cause paint chips when removing. We recommend waiting four weeks before applying to freshly painted walls.